The Basic Life Support course trains participants to promptly recognize several life-threatening emergencies, give high-quality chest compressions, deliver appropriate ventilations and provide early use of an AED. In this instructor-led course, students participate in simulated clinical scenarios and learning stations. Students work with an AHA BLS Instructor to complete BLS skills practice and skills testing. Students also complete a written exam. Q: Who is the intended audience for the BLS Course? A: The AHA's BLS Course is designed for healthcare providers caring for patients both in prehospital and in-facility environments. Q: What does the term "in-facility" mean? A: In-facility refers to healthcare providers who work in a hospital, clinic, or other healthcare facility including a dentist office, skilled nursing, and assisted-living facilities. Students will receive a certification e-card via email. Cost is $65/person. Cancellation Policy: Cancellation more than 5 days prior to start of training results in a 25% cancellation fee based on the class fee. Cancellation 5 days or less to the start of training results in no refund. 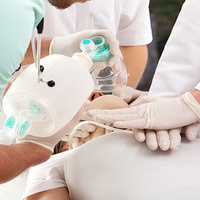 Need BLS training for your business? Give us a call at 701-662- 1578. For a minimum of 8 people, we can coordinate a BLS course at your facility or at one of our training sites!